JARNO TRULLI, THE RACE FOR IDEAL. You can certainly feel disapointed and blame Jarno as he failed to grant a "proper” leaving Formula 1, with the farewells, with photos, with fine, but standard words ... (I would rather continue: with fake smiles and empty parting words, feigned optimism and ill-concealed sympathy - in response to ...) But Jarno did not need it, he made it clear that he had no need for such a show. During these 2 years Jarno has not celebrated any of his anniversaries in Formula 1, even his birthday parties, he is permanently most indifferent, if not sad in the days of Grand Prix, he takes as a matter of course many things, which have never been accepted earlier…. - why? 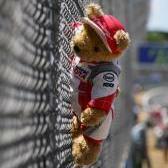 It's just that Jarno had long retired from Formula 1 ... and even said goodbye ... and we did not notice ... Without informing the public at large about it, he said goodbye nicely, but that was known only to the initiates, and gave a sincere joy to the fans, the joy that was not overshadowed by any falsehood, no sadness due to the imminent parting. This is Jarno ... Well, we did not notice that he has gone, that virtually we have watched the races without him for two years already... Although is it proper to say "watch the race"? Personally, I see only a flashing line with yellow and green digits ... So, I've just started to understand all this now. He has gone, and even said goodbye. Look at this: (Honestly, there has been a farewell taste already, just we, the fans, did not want to believe in it and accept) But unlike us, Jarno fully understood, he accepted and let it go- the end of his career at Queen of Autoracing, the end of his participation in The Grand Races. He realized that there would never be again like this: and so won’t be and no more free-hearted mirth in the days of the Grand-Prix and the tests He had already said goodbye to us, and we did not notice ... All the signs showed it- his behavior at the end of 2009, and then - in those two years, and only the fans blindness allowed to ignore that. So, it was the final point. What happened next? Just a job. This is his profession. Well, there it is. What else can be incriminated to Jarno? What else can be his fault for all these past years? Did Jarno have a lack of fierce ambition or any vanity? Who had lack? That is the question. Some team leaders, his fans, opponents or team-mates? It is definitely clear that not Jarno himself. Jarno had enough professionalism, skills, speed, tenacity and stubbornness, the ability never to give up - either under the oppression of circumstances or the weight of pressure, enough of obsessive passion for the ideal and surprising ability to realize sometimes this stunning almost impossible ideal on the track. Jarno had no need for a passion of the omnivorous status-seeking, burden of vanity and unrealized ambitions, because nothing extinguished his love for racing and his work. So it is his fortune rather than his fault. Indeed, this is clear - this man who became a champion at the age of 13 (! ), who received a World Cup championship together with great Senna on a FIA gala ceremony at the age of 17, who won every victory only possible at that point by the age of 20, won F3 championship on-the-fly and entered F1 just due to his talent, this man could not worry over any unrealized ambitions. Of course, many drivers - great champions, kept fierce ambition throughout their career, but only they know how much did it cost for them inward. The harmonious nature and healthy self-esteem of Jarno did not burn his soul with the vanity fire and we can only be glad for his psychical equilibrium. Perhaps we would like this, but Jarno is happy to be as he is and I fully appreciate it. Jarno Trulli has always been (and still is, that is unbelievable for 15 years in the Piranha club!) an faultless racer. He has never demanded the preferences, never demanded the opponents to cave in, and never caved in himself, he did not obey the *team orders* and did not ask the team of such help, he has never intrigued or kowtowed to the boss, he always spoke his mind, even if his words were disliked by some people, he apologized if guilty, but never blamed the innocents (! ), he always realistically and honestly assessed the opportunities as for him own so for his bolid and team, he said “I am lucky” if he was into luck, and he said "I unlucky” if he really was. He kept up a friendship with a man who was considered by some ones been involved into the departure of Jarno from the top team, after all 10 years of joint participation in the Big Circus (!) Indeed it's not just my opinion - Matt Bishop: - "Nasty temper? Not at all: just, unlike many other racers who have an engine of pride instead of a heart, he spares the feelings of others ... ". (2005 - - the peak of Jarno success). Jarno Trulli: "I also know how to fight, you can be sure of it, but it should be the right time and the right place for this ..." - at the same time. by zlata, December, 07, 2011.